Black Metal and Brews: Hoggle & Ludo- "A Great Beast Becomes a Great Friend"
In my last post, I mentioned how much I love split releases. This is also something I've mentioned more times than I probably should've over the past six and a half years, but it remains true. Today we're looking at a split between two harsh noise artists approaching a similar topic and working with each other's source material to create new art. I'm not going to pretend this is coming with high recommendations for the average reader, as this is intentionally challenging art. Not in the sense of "oh, your weak ears aren't ready," so much as that there is an inherently smaller audience for wall noise and I understand exactly why many may not enjoy it. Still, I feel it's worth celebrating those who are outsiders even in an outsider community, which is why the ongoing works of Hoggle (and this one-time appearance from Ludo) warrant attention on my blog. I hope you'll at least take a short bit to acquaint yourself with this before writing it off entirely. Hoggle, as you may have guessed, is a noise artist whose art is entirely based around the cult classic film Labyrinth. I'm going to assume that most readers have at least a passing familiarity with the film, from its kitschy Muppet-driven cast to the prominence of David Bowie's bulge throughout the whole damn thing, so we're not diving too deep into that. Essentially, Hoggle's methodology on the few albums in my personal collection seems to be straightforward enough: song kicks off with a sample from the film before crumbling low-end static roars for eight to twenty minutes. This may seem formulaic or repetitive (and, to be fair, it may actually be at times), but I truly enjoy pairing my childhood nostalgia with my adulthood appreciation for experimental music in its many forms. I am a firm believer that noise works better live, when one can witness the form in which it's created, but recordings can still inspire and excite the imagination with a dedicated listen. In Hoggle's harsh noise labyrinth, I'm often reminded of why I'm drawn to such fringe works. This isn't necessarily meant to be groundbreaking; harsh noise wall is a genre rooted in consistency rather than reinvention, and Hoggle is a project dedicated to a film that was released thirty years ago. We aren't looking to the future here, we're looking at and reinterpreting our own experiences. On this two-tape set, Hoggle is joined by Ludo, a new moniker from Floridian noise luminary Hal Harmon, whose works as Vasectomy Party were some of my personal points of entry into the harsher spheres of modern experimental music. Some of the delight I get from this release is seeing Harmon's homage to a peer. Rather than simply performing tribute by crafting something similarly inspired, it's great to experience tracks like "You Seem Like Such a Nice Beast," wherein Ludo takes Hoggle's work and remixes it into a new kind of aggression (and on the two tracks on the B-side of the first tape where the roles are reversed). I'm not intimately aware of the noise scene's interpersonal politics (and from what I've gathered I'm better off for this), but I love seeing artists collaborating and celebrating their mutual styles rather than sniping at each other or working in direct competition. In such a niche community, we must find the common ground and work together. The very nature of the characters in question (and the title of the split) imply exactly this: an individual who may seem like a threat can be an ally if treated with respect. As for the music itself, the two tracks of pure Hoggle material are less straightforward than they may appear. "Things Aren't Always What They Seem in This Place" sets things off both as the opening track and thematically, as the initial wildness of the wall condenses to a more focused, tightly wound rumble after a few minutes, only to blossom into another form of motion and vastness entirely a few minutes later. The slow shifting from chaos to a more distinct form into new chaos defies expectations and rewards a close listen, although the definition of "reward" in this context may vary for different listeners. While its accompanying track "The Goblins Torment the Snared Beast" is a more vicious, jagged take on the genre, it's no less deserving of a focused listen. If anything, the raw energy on display here makes it easier to sink into the sound and follow its ferocity. The tracks of Hoggle working with Ludo's source material that make up the B-side of the first tape follow a rather similar path, but not identical. 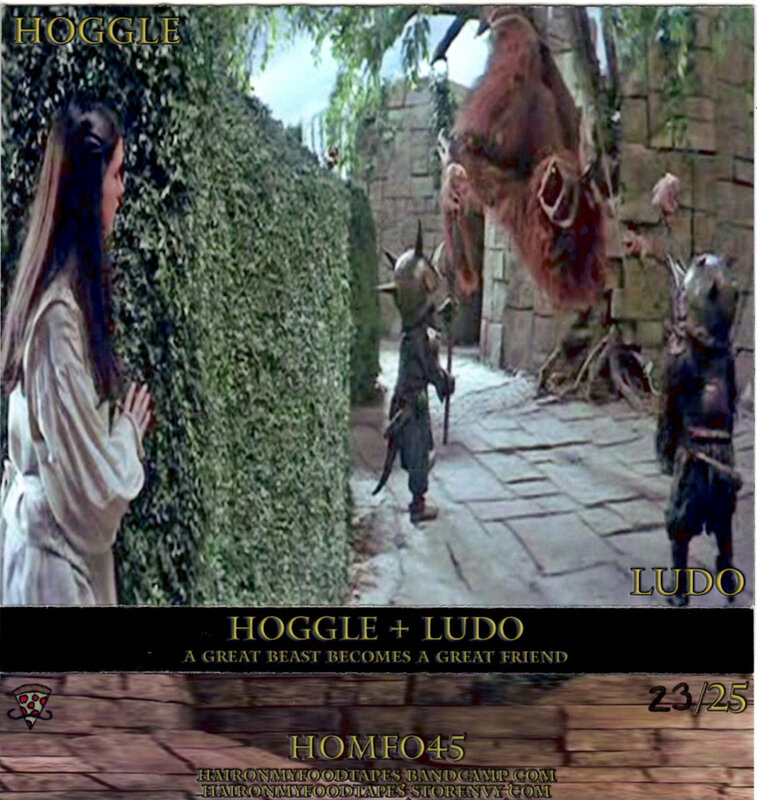 Ludo's contributions begin with two rearranged versions of Hoggle material, showing a clear deviation in form. "Is That Any Way to Treat Someone That's Trying to Help You?" is an especially strong deviation, following its trademark film sample with sparse, crackling noise that feels more like fizzling embers than an outright din. The slow build of this track, with density creeping in behind the main layer of sound until the two become one, highlights a difference in approach leaves me haunted. In an even more subtle shift, on "You Seem Like Such a Nice Beast" we hear one of the film's most tender moments slowly overtaken by crunchy mid-range frequencies and the hint of a low pulse. It's refreshing to be able to distinguish the two artists while still finding them complementary. On Ludo's own tracks independent of Hoggle, the format remains consistent, although the walls feel slightly more solid and unwavering, with "A Proper Introduction For New Friends" building from hisses to monolithic sections of impenetrable horror and its counterpart in "A Journey Renewed, But Still Lacking Knowledge" displaying uncompromising harsh mastery. All told, this release satisfies a certain itch for me. I can only hope it'll hit the spot for you. With just under three hours of music on these two tapes, it's certainly worth the $15 price tag. The Ludo tracks may be a bit better suited for those who are newer to the genre, but the whole release highlights the appeal of harsh noise wall while also showcasing the potential for diversity in an inherently rigid genre. Order through the Hair on My Food Tapes bandcamp page for a tape and a download, as Storenvy orders don't come with digital files (your author may or may not have found out the hard way) and you may as well get the whole package deal if you're going to commit. Enjoy.